We are dedicated to cultivating a healthy environment for humans and animals alike. With the support of the municipality, local schools, and national animal welfare organizations, AZI is making a significant contribution to the local economy of Amorgos. Animal poisoning, torture, and starvation is all too common. We work to fight the mistreatment of animals and foster a healthy relationship with the environment. A sterilization program in partnership the Niarchos Foundation and the Paula and Peter Fasseas Foundation was initiated in 2015 and continues to the present. AZI has an active adoption program for dogs and cats. Since its inception, many animals have been rescued, cared for, and prepared for adoption. Tens of animals have been adopted abroad. AZI has invited the Greek Animal Welfare Fund (GAWF), or Animal Action, to help care for some of Amorgos’ horses, mules and donkeys. Members of GAWF now visit Amorgos annually to treat productive animals. AZI also consistently works with the veterinarians of the Greek Volunteers Vets (EDKE), who come to the island for sterilization and vaccination projects. AZI’s outreach effort extended to farmers and restaurateurs. Educational lectures were given on how to treat and live harmoniously with animals. Three books were created, published, and distributed to all the schoolchildren on the island. These illustrated books promote a positive and humane treatment of all animals and emphasize the value of a compassionate relationship between people and animals. AZI distributed thousands of ashtrays to encourage residents and tourists to keep the environment clean and free of cigarette butts, another crucial step toward learning how to respect nature as a whole. AZI promotes lectures for school children and farmers. With our encouragement, a local volunteer organization has been established—the Philozoike Merinma Association of Amorgos—with over 30 members and five dedicated coordinators. Built the first shelter for quadrupeds on the island, saving a mare and donkeys and mules from certain death. The Mayor of Amorgos has granted us this land and we count on the continued support of the municipality to preserve this significant location for the children of the island and tourists. Farmers and owners of vegetable gardens offer their care of our rescued animals in exchange for the organic manure used in their gardens. Beginning October 2010, the first permanent veterinarian clinic opened with our support, offering surgical services. Emergency medical care is also provided. Fight against poisonings! Prior to our arrival, local restaurateurs would routinely poison cats each spring to “prepare” for the tourist season. We worked very hard to eliminate this practice and are proud to report that there were no poisonings this year in the areas where AZI has intervened. There are many hungry animals on the island. Our support helps provide food, water, and shelter to needy animals, and especially to the dogs that are kept in faraway places in deplorable conditions. 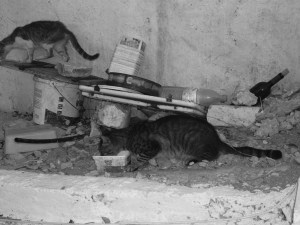 Each day, AZI feeds approximately 300 stray cats, 35 stray ducks and geese in the areas of Katapola, Chora and Aegiali. To the animals living in these colonies AZI provides vaccinations and veterinary coverage when necessary as well as parasite protection and treatment every four months. AZI consistently organizes and financially covers visits of several veterinarians from all over Greece in order to provide veterinary care to animals (domestic and stray) of the island. In 2007 AZI sponsored the work of Naxos veterinarian Dr. Dimitris Vassalakis, who still makes regular veterinary visits to Amorgos. 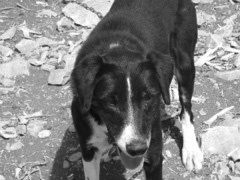 In 2011, AZI brought to Amorgos Dr. Maria Despoti, and sponsored a large part of her veterinarian practice until November 2014, when she left the island. Starting in 2013 and continuing into the present, AZI sponsors the work of Athens veterinarian Dr. Angeliki Degleri, a specialist in feral cat populations. From the year 2012 until today we have worked with 25 different veterinarians whom we have invited to the island. AZI covers the costs of their visits, including accommodations, food and travel expenses. Read about the lives we have touched on our blog.